***Disclaimer: Only league-drafted teams will be allowed to play. No select teams. No combined REC teams. Teams must submit an official team roster at check in. No additions/substitutions to official team roster (i.e., “pickups”) allowed. 8U Killer Kleats on the road to Nationals! 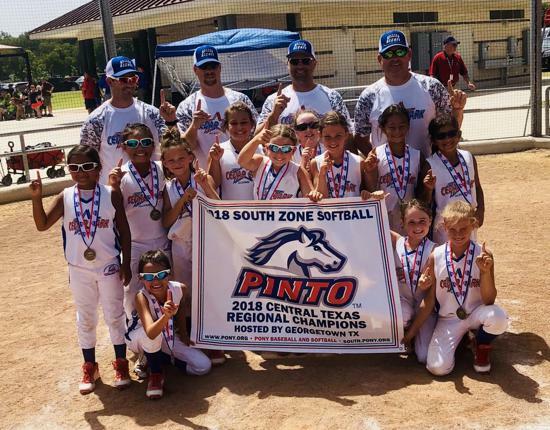 Congrats to the 8U Killer Kleats for qualifying for Nationals in Laredo, Tx. Their All-Star season this year has been a huge success with a number of victories in their previous tournaments. Results include: 1st Place - Round Rock All Star Round up, 1st Place - Georgetown Beat the Heat, Pony Sectional Champions, and Pony Regional Champions. This is an authentic autographed jersey worn and signed by three-time World Series champ John Lackey (Cubs #41, pitcher)! If you're not excited enough about the jersey, perhaps you'll be persuaded to bid knowing this basket also comes with ballpark classics such as peanuts, Big Chew gum, popcorn, and Cracker Jacks! All fields are OPEN for scheduled practices and/or games.. Please contact your team manager with any questions regarding the plan for the remainder of our fall season. The Registration "Softball" is not currently available.